Kintavar will be in Toronto at the PDAC from March 3 to 6 at booth #2642 and as well will be presenting its core from the Mitchi project at the Core Shack display #3104 on Sunday and Monday, March 3rd and 4th, 2019. Please come and visit to talk to the management and our geologists to learn more about the Mitchi project. Cross section 2+50 for the Sherlock zone. "We are very excited with these final results from the 2018 drilling program. We have drilled over 10,000 meters, discovered many new mineralized zones and learned a lot about the geology and the structure of the Mitchi project in the past year. As we advance, the intervals become longer and grades inch higher while the Sherlock zone remains open laterally and at depth. With ongoing metallurgical testing, we are hoping to begin demonstrating some economic potential of the stratiform mineralization of the Mitchi project and what we believe could become a district scale project with the entire sedimentary basin having already been staked by Kintavar and royalty free. We are looking forward to going back in the field in the spring to begin drilling the extensions of the Sherlock zone and continue working on the Conan zone,” comments Kiril Mugerman, President & CEO of Kintavar. The interbedded nature of the sedimentary system and the associated mineralization is put in evidence once again as 5 separate intervals ranging from 4m and up to 17m produced grades ranging from 0.59% Cu and 0.64% Cu. These intervals are very important for the ongoing metallurgical test work including various sorting methods that are often used to upgrade mining ores. If demonstrated to be applicable, it could deliver major advantages that can lower capital costs significantly and reduce the footprint of a mine, which are not applicable in traditional bulk mining copper porphyry deposits. 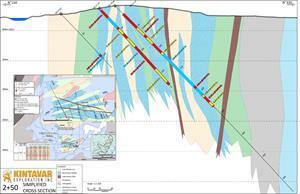 Another important discovery of drill hole MS-18-46 is the marble unit at the end of the hole. This is the northernmost marble unit discovered in the Sherlock zone and although it did not return significant intercepts, copper sulfides were present and increasing over the last 20m of the drill hole which ultimately was stopped due to reaching the drill rig maximum depth capacity. This northern horizon will be investigated in 2019 on surface with trenching and additional drilling. Figure 1: Cross section 2+50 for the Sherlock zone. Click here for full size image.